Though construction looks far from done, reassuring estimates say the rotunda should be completed before we all wither into nothingness. Optimistic reports have been released regarding the construction on the rotunda, showing that it should definitely be completed within our lifetime. 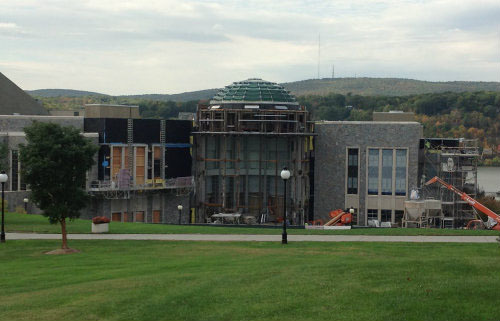 Students and staff have expressed concern throughout the semester over the progress of the construction. These concerns were quickly put to rest, however, when contractors assured students and staff that the renovations would be completed at some point before we all collectively shake our mortal coil. Our reporters planned on interviewing the contractor to discover just what they were doing with those giant metal polls for three months. The interview was cancelled, however, when reporters were reminded to put their worries in a sack, because the project is sure to be finished before our final judgement at the gates of Heaven. Though some doubts still remain, most students are relieved to hear the good news. “It’s comforting to know that I’ll be able to see walls put on the this building before I’m lowered into a shallow grave,” said Marist student Gene Ackerman. “It’s all we can really ask for,” he added, reiterating how blessed he felt that he would see construction completed before becoming biological compost. Reports for the construction of an on-campus track were not so optimistic, though estimations did say the project would probably get under way some time before Armageddon begins raining hellfire on all mankind. November 12, 2014 in On-Campus.